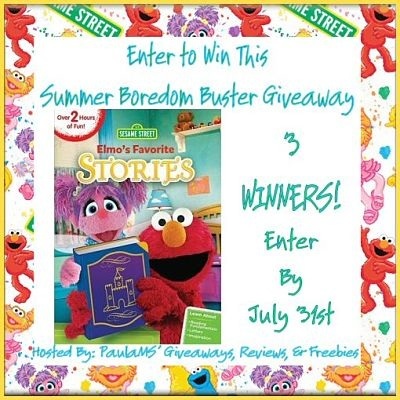 This giveaway is part of the Summer Boredom Buster Giveaway Series that has been put together to help you find fun activities and things to do during summer vacation.With this DVD full of your child’s favorite characters reading great stories and even coming up with some creative ones of their own this DVD is sure to both entertain and get their imaginations going. My review copy arrived in the mail today and my granddaughter is already asking to watch it a second time. I love that these DVD’s from WBHE are also educational. She’s learning abut reading fundamentals, letters, and imagination while being entertained. and to celebrate we’re doing a giveaway! Includes Over Two Hours of Fun with Your Furry Red Friend Elmo and Your Favorite Sesame Street Friends! Sesame Street: Elmo’s Favorite Stories is a compilation of engaging and educational stories for preschool children. In one story, a disagreement arises between Big Bird and Elmo as they are about to act out one of Elmo’s favorite stories, “Maria the Cowgirl.” In another story Abby recalls that green creatures are often princes in disguise! Abby soon concludes that Oscar could be a frog—he is green isn’t he?—and therefore is also an enchanted prince! She thinks that a kiss is the only way to break the spell and turn Oscar back into Prince Oscar. Children will learn early reading skills such as letter recognition, letter sounds, and story structure (beginning/middle/end) as the Sesame friends use their imaginations to make up and act out all kinds of stories. I would like to give a big shout out to all the blogs participating in this giveaway! I couldn’t do it without you. Thank you for bringing this promotion to your readers. By following us on our social networks and by email we can get the best giveaways together on the internet! Please take a minute to follow, like, and subscribe to these great bloggers! Thanks!Chances of winning depend on entries received. Winning entry will be verifiedGOOD LUCK! Disclaimer: PaulaMS’ Giveaways, Reviews, and Freebies nor any blog promoting this giveaway, is not responsible for the awarding of the prize. Sponsors are responsible for prize fulfillment. Any Questions about this giveaway? Email Paula At paula_stewart (at) ymail (dot) com.Disclosure of Material Connection: PaulaMS received the product mentioned above for free to facilitate the writing of this review. Some of the links on this blog post are affiliate links. This means if you click on the link and purchase the item, I may receive an affiliate commission. Regardless, she only recommends products or services that she uses personally and believes will add value to readers. I am disclosing this in accordance with the Federal Trade Commission’s 16 CFR, Part 255: Guides Concerning the Use of Endorsements and Testimonials in Advertising.